*Disclaimer: This post is based on personal experience and may not work for every artist. The formula used takes into account US pricing and may not translate to international markets. Art is an odd thing. Pieces that take days of work–intricate landscapes and lifelike portraits–can sell for $50 at a flea market. Pieces that look simple and take less time to complete can sell for thousands in galleries. Travel to another part of the world and the reverse may be true. Mind you, regardless of perceived monetary value, all this art still involves skill, technique, and creativity, and thus deserves respect. Art is a fluid idea. Its value changes depending on who is looking at it, where you are, the history of the artist, the story of the piece, and more. There really isn’t a universal monetary value to what you create. Which makes assigning a dollar amount to your work very frustrating, and sometimes confusing. I’ve been there. I’ve put a lot of guesswork into pricing my art over the years. Trial and error. Haphazard market testing, if you will. 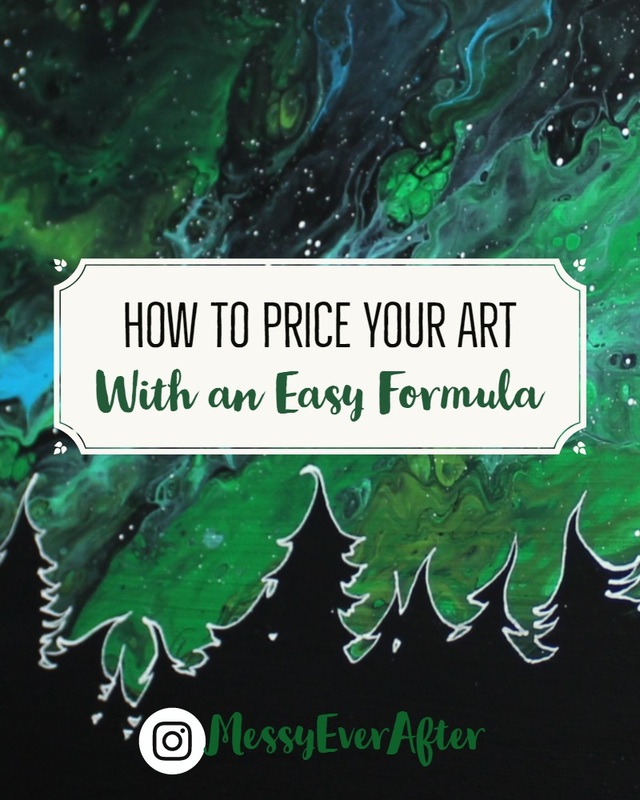 I’ve been using a common formula with some added calculations for my pricing. It’s not an exact science. It might not work for everyone, but it’s a place to start. If you are already an accomplished artist with many sales under your belt–this post probably isn’t for you, but I would love your feedback on the formula to see it if is accurate to your experiences. This formula is really common in the art world, but figuring out the right price per square inch can be a bit confusing. Lucky for you, I’ve created an assessment that will help you figure out the right price. Using a variety of factors, I have created five artist ‘levels’ with price ranges that includes discounted prices, regularly priced pieces, and premium priced pieces. All artists have to start somewhere. Even if your skills are out of this world right at the beginning, you likely will under charge until you grow a following and establish your brand. If you can make sales immediately at a high price, kudos to you! Get that money. The levels I have created are intended to assess where you are in your career based on a variety of factors, and not just how skilled you are as an artist or how ‘good’ your art is. To determine your level you’ll need to evaluate quite a few variables like: What kind of artist are you? Where do you plan to sell your work? How common is your art style? How big is your following? How many successful sales have you made? How skilled are you? How unique is your style? What kind of art does the market want? A lot of this is incredibly subjective, butI’ve created a handy little assessment that will give you a rough idea of where you are in your artistic journey, but remember this is not a hard and fast rule for how you should price your work. This is a tool that should only be used to give you an estimate that you can completely ignore if you don’t like the results. Level One: You’re an art dabbler. You don’t really know your style yet, but love to create. Maybe you do this as a hobby and don’t really need to make sales. You don’t have a following yet and you will maybe try selling on Etsy or at a local flea market to see if people like your art as much as you do. Level Two: You want to be a professional artist, but maybe just part time. Maybe you’re okay with just making enough to pay for art supplies. You’re likely selling to family and friends at the moment. You have developed your skills, have started to find your style, have made a couple of sales, and you just started to think about pushing to grow your online following. The world is your oyster! Chase those artsy dreams! Level Three: Your style is developing nicely and you still practice your skills often. Your social media following is starting to take off and you are thinking about taking the leap to do this full time, maybe even enter some juried group shows or art fairs. Level Four: You’ve made a lot of sales and your social media presence keeps growing. You are thinking about applying to more prestigious art fairs and get into a gallery for a solo show soon, if you haven’t already participated. You’ve developed your unique style and people have started to recognize your work upon first glance. Go you! You’re killing it! Do you feel the assessment was accurate? If so, continue on. If not, pick which level you feel is more accurate. 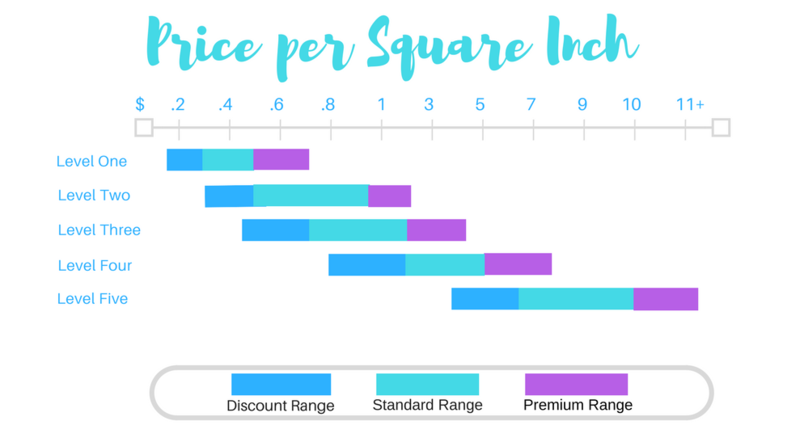 Now that you know your Level, look at the ranges on the chart below to see the prices per square inch to consider. Again, this is all very subjective. You may be in a level above or below where you scored on the assessment. And just to be clear, this assessment does not determine how awesome your art is! It’s a nonjudgmental tool that is limited in its ability to serve all artists. Once you know what your average piece will cost, slide up and down the scale to price your most expensive pieces and your lowest discounted prices. If you frame your work, add this fee on top of the calculated price above. If you make your frame, factor in the labor and also add that on top. This calculation only determines the base price of your raw piece of art. These tools are just to help you get an idea of how to price your work. I’m not trying to definitively tell you what your art is valued at. I want you to test out one of your pieces in the formula above and review the next few points. Does it Cover Your Costs? Estimate the material costs or your piece (paint, paper, canvas, etc.). Does this formula cover your investment AND leave a decent profit? If not, you may be in the wrong level, or you’re spending WAY too much on art supplies at the moment. Does the price match up to what artists similar to you are selling their work for? Check out events that you want to sell at. Talk to other artists. Research listings on Etsy. The economy and market saturation of similar products will have an effect on what you can charge for your art. You may need to adjust your formula a bit to account for this. If you start out selling your work at craft and art fairs, and then upgrade to a gallery and have to increase your prices to account for the commission fee–this is your new base price per square inch. Even outside of the gallery. Consider it like reaching a new milestone. If you do another art fair after successfully selling at a gallery, apply a visible discount to this price instead of just lowering it to account for the market shift. Beware of under-pricing your work once you’ve moved into a new level. I have attempted to give my art away. When I first started out, I undervalued my work drastically, because I was desperate to make sales. Once my following started to grow, I received a lot of “You don’t charge enough for your work,” types of comments. It seems odd, but you can actually miss out on sales, because a low price might indicate low quality. Beware of over-charging for your work to match other artists. Your work may be similar to another artist with a larger following, but you may have a harder time selling at the same price point. Larger artists have spent a lot of time building their brand and a sense of trust with their audience. It takes time to get out what you put into your art, but be patient! It’s worth it. Price your art to be able to apply discounts without sacrificing profit. When I started my online site, I decided what my average price was, but I knew I couldn’t sell my work for that price where I live. It’s a predominantly blue collar place. Art is appreciated in my town, but you can’t force people to justify paying their rent vs buying a new piece of art. So, I created discount labels that still display my regular online store price, but made it clear my customers were getting a deal. This also helps your sales for those events. You create a ‘buy now or miss out!’ type of urgency. If a customer feels like you treated them really well with the first discounted purchase they made, they are much more likely to save for your higher priced pieces. When can you increase your prices and establish a new constant? Play around with your pricing for about a year at a time. If your art style, following, or sales numbers don’t change much in that time you may not be ready to adjust pricing (This could also mean you may be priced too high or you need to evaluate your self promotion tactics). Even though pricing is subjective and fluid, you still want to be able to explain the changes and not scare off customers. If you suddenly have so many requests for art that you can’t keep up with demand–it’s time to increase your prices. I hope this was helpful for any new artists out there! Since I started using this formula, my life as gotten easier. Let me know your thoughts on the formula below! Do you feel it was accurate? Did it give you an idea of where to start? Thanks for reading and check out my previous posts for more artsy goodness. I’m a “level 3″ artist by your quiz standards (seems pretty accurate!) And love how much this article covered. I find LxWxPrice doesn’t work on my very small pieces (4×4 or smaller) not the largest ones (36” And more) because the prices change exponentially. I use L+W x Price and change my price accordingly. I find that’s more consistent and keeps covering my costs/time 🙂 just an idea! Emilia, thanks so much for reading! I totally agree that the pricing structure might not work the best for the extreme ends of the sizing spectrum. I’m glad that for the most part the assessment was accurate for you! I loved this topic it is super helpful for a new artist. The only confusing part was what number is put into the “Artist Constant” in the calculator is that where you put the price per inch or the level we got from the assessment? Whoops! My apologies. I had made some edits and swapped out “Artist’s Constant” for “Price per Square Inch” and missed that label! Yes, that’s where you’d enter price per square inch. Thank you! I needed this!! Thank you!!! Really well-written. I love that you put so much thought into really precise analysis, breakdown, and easy-to-understand explanations of the concepts in your blogs! Thanks for doing this and being so generous. Thank you Kelly for an informative and easy to follow post! Loads of useful information and factors I hadn’t even considered so well done and thank you for sharing your knowledge.